I figured I would never reach the bottom of my fragrance sample box at this rate, and I was also inspired by Larie's "Scent Of The Week" series. 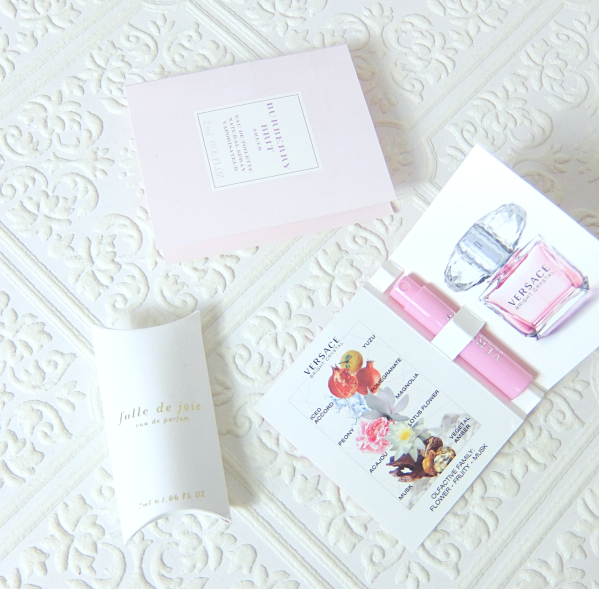 So here is another installment of my Perfume Diary featuring three different scents at once. Bright Yuzu, Pineapple Leaves, Litchi, Mandarin, Grapes, Pink Peony, Peach Blossom, Nashi, White Musk and Creamy Amyris Woods. Burberry Brit Sheer is the least favorite of the bunch. It is basically a watered-down cocktail of fruits and flowers with a bit of musk thrown in. With very little presence or impression, I did not even understand what I spritzed when I first tried it. Out of my effort to "understand" the scent, I easily used up my sample by spraying it all over my body. Still, nobody complained nor did I feel that I needed to apologize even in the hot weather. Burberry Brit Sheer is a very light and safe scent and impossible to overdo since it fleets instantaneously, which I think is the only merit of it. I learned that it actually smells nice if I liberally spritzed it on my hair, though. sweet citrus, woodsy florals, cognac, jasmine, rose, spicy wood, leather. I did not know what to expect from Folle De Joie (roughly translated as "ecstatic"). I think I was even afraid because of the leather note. To my surprise, it is ultimately a spicy rose scent on me. It is initially heady and even boozy thanks to the cognac and jasmine, but it quickly settles down to a sensible rose with a little bit of sass. I quite like it! I might have considered a full bottle if it had come in a smaller size. With a cabinet full of perfume, buying a 3.4 oz bottle is unthinkable for me. It is a beautiful and interesting rose perfume (well, at least on me), but there is other rose scent that suits my personality better. Iced Accord, Yuzu, Pomegranate, Peony, Magnolia, Lotus Flower, Acajou, Vegetal Amber, Musk. 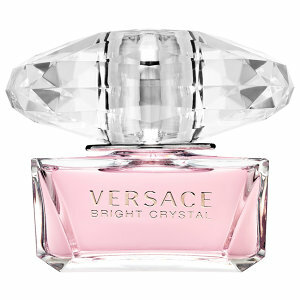 Versace Bright Crystal seems widely popular as I can often catch a whiff of this on the street from a stranger. It is a sweet floral but not an overly cloying kind. There is a touch of cool flavor despite of its sweet nature. I'd say it is very typical but well-balanced. Bright Crystal is a seductive summer juice that blooms on skin even prettier in the warm weather. On me, peony is pronounced the most with quite a long tail of amber and musk. Not bad, but the pomegranate note kind of ruins it for me to completely like the scent. It is just that fruits don't usually play nice on my skin. The citrus and the aquatic floral just disappear, as usual. Bottle is absolutely gorgeous and I wouldn't mind having a small bottle sitting on my vanity, you know, for the vanity purposes. Hope you enjoyed this entry. Have you tried these fragrances? Anything lately that is exciting and full-bottle-worthy to you? 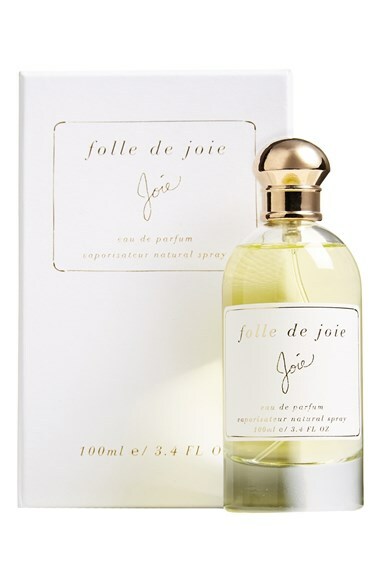 Joie Folle De Joie sounds delicious is because I love it the citrus notes! You and Larie have such sophisticated noses. Mine is allergic most of the time, so I tend to be very basic with my perfumes. (read mainstream and boring) LOL! Ok that Folle de Joie sounds like something I'd really like! A boozy, leathery rose-I need to sniff it for sure! I love perfume samples as they are the best for handbags! I always keep a few in my cosmetic bag, too. I usually just spray once in the morning, but they do come in handy sometimes! I agree there is strong something about Folle De Joie! I try to spritz a very small amount, too. I agree about Burberry Brit Sheer, but sometimes I like mindless things to just spritz without worrying about it getting too heavy or too sweet or too anything...I never bought a bottle of that, but I think it suits that purpose! I've never hard of Folle de Joie! I have to be careful with rose perfume, but it sounds interesting! Thanks for the shoutout, Lena :) More reviews, please! More! I have a few bottles that are really easy to wear yet interesting, like Clean Provence or Alfred Sung Pure. There's nothing offensive about Brit Sheer, but it suddenly is almost offensive when I think about the price. LOL. I would have never followed up with the second entry if it wasn't for your collective post. I even laid out 5 for this coming week, so hopefully another Perfume Diary soon! I really like the idea of sharing these perfume diaries to talk about the vast amount of perfume sample vials we have! Great recap of each! I quite like the Brit Burberry though haven't committed to the full-size yet! I actually quite liked Burberry Sheer. It's one of the few samples I ever finished. I liked it only in the spring though -- I think it felt refreshing after winter's gloom. It's pretty generic though, so no thoughts of ever getting it or anything like that. I really like Burberry perfumes. They're all very clear and sensible scents, making them appropriate for pretty much every occasion! But I might give Sheer a miss, since it does sound very weak! Bright Cristal looks gorgeous ! Love peony ! Need to check it ! Bright Crystal smells gooooood! And the bottle is indeed super pretty. I haven't tried any of these,- I like the sound and packaging of Joie Folle de Joie though! Perfume samples take almost a lifetime to finish....I haven't dove into my stash of forgotten perfumes for a long time!